Alliance Defending Freedom Senior Vice President Kristen Waggoner declared on Thursday that she is “encouraged” and “optimistic” that a Supreme Court with new “originalist” justices is heading toward a reversal of Roe v. Wade, the 1973 Supreme Court decision upholding a woman’s right to abortion. Waggoner made her comments at the Evangelicals for Life conference, organized in conjunction with Friday’s anti-abortion-rights March for Life. 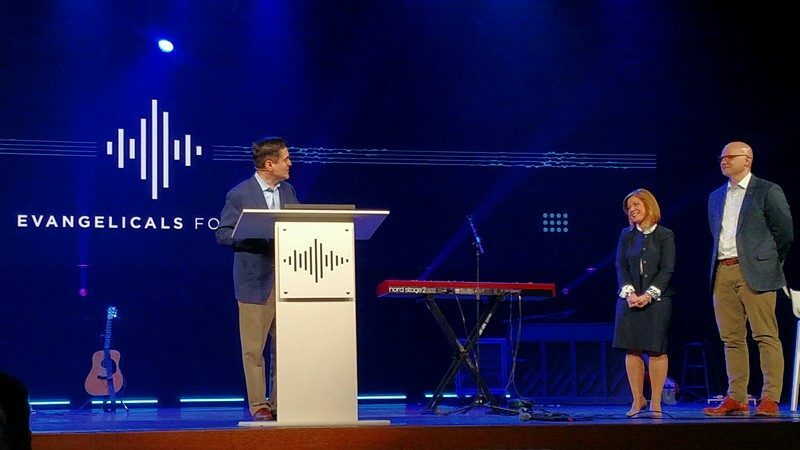 Conference host Russell Moore of the Southern Baptist Ethics and Religious Liberty Commission presented Waggoner with the group’s John Leland Religious Liberty Award, whose previous recipients include anti-LGBTQ equality strategist Robert George and then-President George W. Bush. “We need to have Roe overturned,” said Waggoner, who gave a celebratory whoop when Wussow mentioned the record number of judges President Trump and Senate Republicans have put on the federal courts. It is important to have “originalist” judges on the lower courts who are “speaking truth” and writing persuasive decisions, she explained, because their rulings, reasoning, and findings of fact will be used by the Supreme Court. She said that even with “mixed results” in the 2018 midterms, “pro-life” legislators still hold a majority in most states, and she celebrated the continued introduction and passage of anti-abortion laws at the state level that will move through the courts. “We’re seeing more and more states realize the harm that abortion causes,” she said. She cited the passage of constitutional amendments in West Virginia and Alabama that explicitly declare that those state constitutions do not recognize a right to abortion. First of all, we serve a God that loves man from the beginning, and it’s his desire to protect people, and we’re his hands and feet here. So we’re filled with resilience, we’re filled with joy, and, I keep thinking about in the times in the Old Testament when Pharaoh is killing those babies, Moses is growing up in his home. So no matter what the circumstances look like, we’re people of hope. ADF is a massive legal powerhouse that has been quite effective in pushing its culture-war agenda in the U.S. and around the world. It is a major driver of the Religious Right strategy to redefine religious liberty. At last year’s EFL, ADF attorneys excitedly talked about their state-level strategy to overturn Roe by passing ever-more-restrictive legislation at the state level and pushing those laws, as they are challenged, through the increasingly right-wing-dominated federal judiciary—with the ultimate goal of banning abortion altogether except when necessary to safe a woman’s life.